I have class in five minutes- oops! What happened! 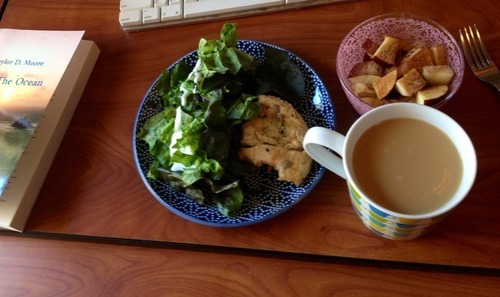 I have been working all morning and afternoon on my writing, and then I finally took a break for lunch. I cut up an apple and doused it in cinnamon sugar (I’m THAT kind of girl), heated up my leftover half a Hopdoddy’s burger, and made a huge red leaf lettuce salad. I head back to my room with my grinds and a hot cup of coffee and I’m like, wow, I guess class has been bumped from my priority list for today? It was going to be a boring class anyway. Lately different groups have been presenting their books like a grown up version of fourth grade book reports. Last class, I brought the writing I’m working on to reread and go over, since I personally find three English majors mumbling about Taiwanese marriage practices to be unbearable. Right now I’m on lulu.com (NOT lulus.com- although they keep emailing me to say I have a pair of sunglasses in my shopping cart that they don’t want me to forget about- thaaaanks…) working on the cover layout for ‘Into The Ocean,’ which is my novel if you don’t know. It’s a really easy site to work with, but my computer is being slow and I’m about two unresponsive script messages away from ripping all my hair out. Have a great Tuesday! And go to class.